Rosewood® Hotels & Resorts, the ultra-luxury hotel group that currently manages 23 properties worldwide, today adds renowned art expert Emmanuel Perrotin to its Rosewood Curators program, a carefully selected group of luminaries and leaders who share travel recommendations and insider tips for Rosewood destinations around the world. Perrotin joins Rosewood Curators on behalf of Hôtel de Crillon, A Rosewood Hotel, the landmark Parisian hotel that reopened in 2017 following an extensive four-year transformation. In addition to providing his insider tips and guidance on the best way to experience Paris, Perrotin will also curate one of the hotel’s Ateliers de’Artistes suites with personally selected pieces, including a delicate sculpture by Klara Kristalova, photographs by Sophie Calle, and a colourful Takashi Murakami painting, among others. Nestled under the mansard roof, the Ateliers d’Artistes are located on the seventh and loftiest floor of the hotel, providing guests with a dazzling experience under the skies of Paris. Perrotin’s curated suite, entitled “La Suite du Poète” will launch in September for a limited time only, offering a completely unique, artist-inspired stay in the City of Light. 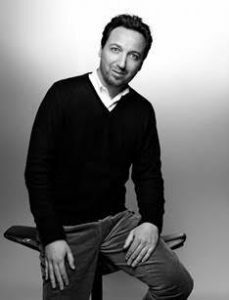 Born and raised in Paris, France, Perrotin developed an intense passion for art at an early age and assumed his first professional role as an assistant in a local art gallery at age 17 before founding his own gallery just four years later. As his career evolved, Perrotin began traveling the world to find the industry’s next talents and participate in international art fairs. Specializing in international contemporary art, he has opened six different spaces in Paris, New York, Hong Kong, Seoul, Tokyo and Shanghai (in late 2018). He represents an impressive roster of over 50 influential artists worldwide, including Parisian talents Jean-Michel Othoniel, Sophie Calle, Bernard Frize or Xavier Veilhan. He participates in about 20 major international art fairs each year including Art Basel (Basel, Miami, Hong Kong), FIAC (Paris), Frieze (London, New York), and TEFAF (Maastricht, New York). With a flagship gallery in the bustling Marais neighborhood of Paris, Perrotin still calls the City of Light his home. When he isn’t traveling the world to attend various openings and art fairs, Perrotin takes advantage of the many marvels his hometown has to offer. As the Curator for Hôtel de Crillon, A Rosewood Hotel, Perrotin shares his favorite ways to enjoy all that the capital city has to offer. Perrotin prefers to explore Paris on foot or by bike, which he advises are the best ways to discover the city’s new restaurants, hidden museums, and quirky shops. Though Perrotin acknowledges that many travelers will be drawn to the city’s signature art establishments, such as Le Centre Pompidou, le Palais de Tokyo, and le Musee Picasso, he recommends visitors make time for the lesser known institutions, particularly le Musée Guimet, la Grande Galerie de l’Evolution, and the Musée de la Chasse, which feature unique exhibits and eccentric details that allow for continual discovery, even upon a second or third visit. When it comes to cuisine, Perrotin is adventurous in his approach and suggests travelers try all kinds of eateries. For healthier fare, he recommends Wild & the Moon and for comfort food he suggests Rachel’s, both located in the Marais neighborhood. Travelers looking for very traditional French food should not miss Ma Bourgogne on Place des Vosges. After a full day of exploring the city’s wonders, Perrotin recommends setting aside time to relax. In Paris, he is partial to the Sense, A Rosewood Spa at Hôtel de Crillon, A Rosewood Hotel. Perrotin’s complete Curator interview, including his destination and travel tips, can be found on Rosewood Conversations, the brand’s new online travel digital platform. First launched in 2013, the Rosewood Curator program includes fashion icons Anna Dello Russo and Iris Apfel, prima ballerina Tan Yuan Yuan, designer Zac Posen, Academy award-winning actress Allison Janney, and auctioneer Simon de Pury, among others. To read and watch the Rosewood Curator interviews, go torosewoodhotels.com/conversations.